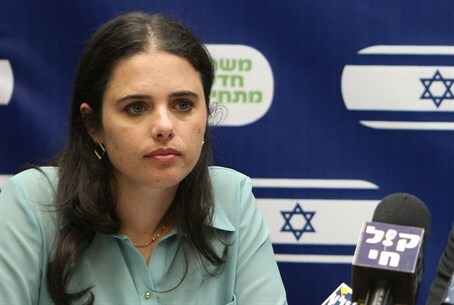 Ayelet Shaked, who chairs the Religious-Zionist Bayit Yehudi faction in the Knesset, said Thursday that she believes the massive cut in the state budget for yeshivas will eventually be averted. Interviewed by Arutz Sheva regarding accusations that party leaders did not do enough to prevent the cuts in the 2014 budget, she said the faction “did not agree and does not agree” with the cuts, and that solutions were being hammered out. The cuts would put the yeshivas' budget at less than 50% of what it was in 2012. On Wednesday night, faction members Motti Yogev, Yoni Chetboun, Orit Struk and Zevulun Kalfa announced that they would not vote in favor of the state budget if the cuts are not cancelled. Meanwhile, dozens of yeshiva deans sent a letter to the Knesset's Finance Committee Chairman, Bayit Yehudi's Nissan Slomiansky, demanding that he prevent the cut to the yeshivas' budgets. “As we all know, the state buget that is to be passed by the end of the month includes an ugly cut to the budget of the yeshiva world, which obviously will deal a mortal blow to the yeshivas' ability to exist,” they wrote. MK Shuli Moalem, also of Bayit Yehudi, criticized her teammates for their announcment, hinting that they were deceiving the public into thinking that the rest of the faction members were less resolute than them on the matter. "Forgive me, friends, but it is cheap populism, to issue a statement like that in the name of the four of you, when you know that this is the position of all of the faction members, and that we are all acting intensively to cancel the terrible cut in the yeshiva budgets,” she said.